I am pleased to report that progress all be in slow is still heading in the right direction with our British breeds. Helen and I met up with JLF in November and due to personal reasons he hadn’t made as much progress with our redraws he confirmed all was well now we have a better understanding of each other. Currently we have 28 of the breeds with SDA as GB although we know from working with Jean Louis there are several more breeds which will be confirmed as GB at the next EE standards meeting. The confirmed redraws are; Barb, Comp Roller and Tippler, Magpie, Modena, Exhibition Homer, Garden Fantail, Genuine Homer, Show Homer and Show Roller. We do still have some breeds which require work and some with some information missing but on the whole we are still making progress. When the drawings come through we will of course be in touch with the relevant breed clubs for their thoughts. Thanks to all the breeders and clubs for their help. Very positive news regarding our British standards, Helen & I had a meeting with Jean Louis Frindel in Leipzig in December, spending the Friday afternoon going around the show pens, discussing the breeds, the good and bad points and also sat around the table discussing exactly were we are with each of the 45 breed standards one by one. It was very reassuring to know that we are having a input in the drawings and written word, we have a far better understanding that the words we use and the descriptions given have to be so accurate and clear for translation in to any language and relate to the drawing by Jean Louis. Also we now have clear guidance as to how to use words to prevent any welfare issue, simple things like full stops make a huge difference. Jean Louis fully appreciates our traditions and hertiage of our British breeds and shares our passion for standards. 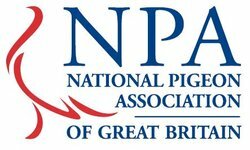 We the NPA have to accept that European Clubs for British Breeds do want input or pass comment on our standards as there are many clubs with large numbers of members and pigeons. Also in some cases we have none of these breeds being bred or shown in the UK. Where our clubs will not or cannot agree on the use of a drawing or the wording we will as a committee make a sensible decision on the course of action. Full explanations are given to the breed clubs as to what we require and the reasons for it, the will result in the NPA UK remaining SDA. Currently there are 28 of the 45 British breeds with SDA as GB. We have 13 breeds with completed written standards and words, 21 almost complete, these are either waiting a redraw of the image after we have supplied further photographs of current pigeons, or are needing odd wording changes, we would expect many of these to be complete prior to the next European meeting. However there are still 11 that need considerable work to bring them up to the requirements so we will be calling on members and breed clubs for assistance with these. Photos or drawings are required of; Lacene, Ptarmigan, Cumulet (show type) if any members have any they would be of a great help. The EE standards committee would like as many standards completed ahead of their meeting in May, to which we are working hard towards. Many Thanks to the breed clubs and members who have help formulate the standards in the new format. If anyone wants information on the details on any of the breeds in particular then please can you drop myself and Helen an email. The United Fancy Homer Club (UK). Overall Impression: Rather a large bird, with a solid, wedge shaped body. 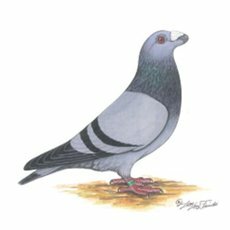 The structure of the head is a splendid manifestation of the art developing a pigeon breed. The distance between the eye and the base of the beak is extremely long. In profile, the curve of the upper head should continue in an unbroken symmetrical arc to the back of the skull with no depression or break behind the wattle. A bird of curves. Eyes: The eye should be white, bright and sparkling, giving the bird a wild appearance, as if always on the alert. Eye Ceres: The cere should be damson black, very fine and hard texture, having the appearance of a silk cord encircling the eye. The softer colours having varying shades and a softer texture. Although there is a slight tendency to growth, the cere should remain naturally fine and dark. Beak: The beak should be black, except in Silvers, Creams, Whites, Yellow or Dun Chequers. In these colours a tendency to lightness is permissible. Both mandibles should be of medium substance and so set that the perfect curve of the head is not interfered with. The upper edge of the under mandible should be quite straight, and both mandibles should fit closely together. Wattles: The wattle should be white, naturally smooth, fine in texture and shaped in the form of a heart, with the division reaching at least half way down. With age there is a tendency to growth, but it should be very slight, and for several years a fine, smooth appearance. No jewing should appear on the under mandible. Throat: The throat should be clean cut, and perfectly free from thickness and gullet. Neck: The neck should be short, thick at the base, but gradually tapering to the point where the head joins. Body: The body should be short and strongly built, shoulders broad, chest well rounded, back broad, flat and straight. Keel of good depth, breastbone straight. The whole body from the shoulders to tail should have wedge shaped appearance. Wings: The wings should be carried over the tail, flight feathers to short, strong and broad, well overlapping each other. Tail: The tail should be short and narrow, closely drawn together, straight and well carried. Legs: The legs should be short, strong and well set. The legs and toes should be quite free from feather. Plumage: The feathers should be hard and close fitting and in great condition. Stance/Carriage: The bird should be of bold upstanding appearance, showing a capability of great activity in all its movement. Recognised Colours: In Chequers, the colours are blue, black, dun, red, yellow and silver. The chequering should be clear and distinctive throughout. The off colours consist of blues, silver, mealies and creams. These should have two broad and well-defined bars on the wings; there are also grizzles. Blacks, browns, duns and white self’s. The colour in all should be sound throughout. Pieds are allowed in each recognised colour. Serious Faults: Pinched appearance behind the wattle. Not enough back skull. Flat on the top of the skull. Not enough height above the eye. Lack of Power/ substance, both in the head and body. Thin, open or wry beak. Twisted beak. Coarse or ill shaped wattle. Soft pale cere. Red/lemon gravel or hard eye. Thick throat or gullet. Frill or open feathered neck, long swan neck. Long shaped body, curved back. Crooked breastbone. Feathered legs or toes. Heavy or wry tail. White or pied rump/hock and other mis-markings in colours apart from Pied colour varities. Long legs, webbed feet, crooked claws or toes. Order of Importance: It is vital importance that the highest standard should be obtained in a typical show specimen. Quality depends largely on a general combination of the chief characteristics of the breed, as opposed to exaggeration of one point. Mere substance should not predominate, but given two exhibits of equal quality, the stronger and longer headed bird should win. Birds when exhibited should be in perfect natural condition. Benefical preparation of an exhibit should be encouraged. Formation of Head 20 points. Year of publication Re-formatted to meet EE-Standard model on 28th December 2011, at the AGM of the United Fancy Homer Club. Origin: Very old breed of British origin, referred to in Moore’s Columbarium (1735). In the past the breed was referred to as a Dragon. It was developed over time from a flying breed of various crosses to a standard show breed by the late 19th Century. First standardized in 1886, when the Dragoon Club was formed in England when the variety was then called the Dragoon and was further developed from the London and Birmingham types to form what we know today. Overall Impression: A Dragoon should be excessive in no property. Hard and very close feathered. Alert and watchful. Great importance is put on the colour of the beak, eye and cere which differs in the colours. No pied versions will be accepted. Size: Medium of size and excessive in no property. Length of Bird – Measuring from the port of the beak to the extremity of the tail, about 15 inches (375mm) when outstretched. 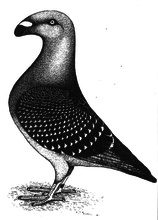 Head: The skull should be fairly massive and deep in proportion to the size of the bird and in the profile should rise gradually from the base of the wattle, forming a gentle and unbroken curve to the back of the head, thence descending to the neck without angularity or lumpiness; the distance from the centre of the eye to the back of the skull being horizontally about 7/8 of an inch (22mm) The top view should be wedge-shaped and broad, yet proportionate to the substance and length of the beak, well filled up behind the wattle and slightly convex from eye to eye. Beak: Both mandibles stout, straight, of proportionate width and of equal substance, close fitting, smooth, terminating as bluntly as possible, set horizontally and measuring from its tip to the centre of the eye about 1 and 5/8 inches (41mm); thus making the entire length from the tip of the beak to the back of the skull about 2 and ½ inches (63mm). The under mandible as free as possible from “jewing”, i.e. growth of wattle. For colour of beak, see special description of various colours. Wattles: “Peg” shaped, i.e. broad, perpendicular and highest at the back, narrowing with equal sides and in young birds, with longitudinal furrows towards the termination of the upper mandible and merging almost imperceptibly therewith. With age, the wattle, whilst still retaining its “peg” shape, should develop into a compact formation, wrinkled in general appearance, but fine in texture. It should be fairly large, yet proportionate to the size of the head. Neck: Of medium length and thickness, entirely free from gullet and widening boldly from head to body. Back: Broad across the shoulders and flat, tapering off to the rump and tail. Body: The shoulders thick, muscular and prominent but, not standing out from the body too conspicuously. Keel straight. Wings: Powerful, the flights short and broad, resting upon the tail. Tail: Running in a line with the back, close fitting, carried clear of the ground, somewhat short in proportion to the size of the bird and extending about 5/8 of and inch ( 16mm ) beyond the extremity of the flights. Legs: Short and well set back. The thighs stout and muscular. Blue – The wings, body, rump and thighs, a deep rich blue of uniform shade throughout. The neck dark and lustrous, beak black, eye cere intense dark blue grey, usually described as damson, eyes bright red currant colour. The two bars, black, well defined about 3/8 of an inch ( 10mm ) at the widest part, no third bar. Blue Chequer – Body, head and neck, a deep rich blue, slightly darker than in Blues. The Chequering on the wings sharp and distinct and black in colour. Free from solid coloured butts. Breast, rump and under colour a uniform shade of blue laced with black. Beak black, eye cere intense dark blue grey, rather darker than in Blues. Colour of eye and bars as in Blues. In former times some very beautiful Chequers existed with light markings on the butts, accompanied by very light under colour. Should these recur, they should not be unduly penalised. Silver – The wings, body, rump and thighs, a uniform light silvery tint ( not creamy ), the head, neck, flights and tail of a deeper shade, neck lustrous and the breast free from bronziness. Beak horn colour, cere, blue grey, eye rich red. Bars as in Blues. Silver Chequer – Ground colour and neck same as in Silvers. Chequering even and distinct and as dark as possible, free from solid coloured butts. Beak, cere, eye and bars as in Silvers. Grizzle – Blue, Silver or Red. The head, body and wings, an even peppery combination of white with blue, silver or red. Neither colour predominating. The flights and tail of a darker hue but, distinctly grizzled. The neck presenting a frost like appearance. In Blue Grizzles, beak, cere, eye and bars as in Blues. In Silver Grizzles, beak, cere, eye and bars as in Silvers. In Red Grizzles, beak horn colour, cere as in Silvers, eye red, bars well defined, red in colour. Red Chequer – The ground colour, flights and tail a creamy grey shade, the chequering a sound red, free from solid coloured butts. Head and neck a sound red. Breast sound red, tapering off under the body to a creamy grey in vent and thighs. Beak, cere and eyes as in Blues, bars red. Yellow Chequer – Ground colour body and thighs, light cream colour, head and neck a deeper shade, chequering clear and distinct of orange-chrome tint, free from solid coloured butts. Bars orange-chrome, beak flesh colour, eye orange-red, cere powdery white. Mealy – Ground colour, flights and tail, a delicate creamy white bordering upon white itself. Neck and breast deep reddish brown, free from greenish tinge. Beak black, cere as in Silvers, eye and colour of bars red. Cream – Head, wings, body and tail a light clear creamy white. Bars a rich yellow-ochre. Neck the same colour as the bars with light frosting. Beak horn colour, cere powdery flesh colour, eye orange-red. Yellow – A soft rich orange-chrome tint throughout. Beak flesh colour free from stain, eye orange-red, cere powdery flesh colour. Red – A uniform deep rich red throughout, lustrous on the neck, beak flesh colour free from stain, eye deep orange-red, cere powdery flesh colour. White – Pure white throughout, beak flesh colour, cere powdery flesh, eye bull or dark hazel. Black – Sound black throughout with no trace of bars, beak black, cere intense damson colour. Eyes as in Blues. Weakness in the head and in down faced in appearance. Excess growth of wattle on under mandible. Failure in eye cere - losing shape and distinction and of incorrect colour according to breed standard. Lack of carriage, not bald and alert. Long in the body and long in flights and tail. Failure of feather and general condition. Failure of colour including beak, according to the breed standard. Thus no pied markings are allowed within the breed as this would seriously compromise these attributes which are so important with the breed. It is of vital importance that the highest standard should be obtained in a typical Dragoon. Quality depends on a general combination of the chief characteristics. Birds when exhibited should be in perfect natural condition. Beneficial preparation of an exhibit should be encouraged. Always breed to the Standard not a personal ideal. Head, Beak, Wattle, Cere, Eye Colour, Carriage, Neck/body/Feather/ Condition, Colour. As revised and adopted by the Dragoon Club, England on November 1st 1987. Copy re-written July 31st 2008 by Colin Jeckell ( Secretary Dragoon Club ) inserting metric dimensions.